Design a registry with any gifts you can dream of, reflecting you and your event. Create a secure online gift registry for your wedding, engagement, birthday, baby shower or other significant event. Your guests can select from your list of gifts and decide what they think will make your special day that little bit more special. We transfer the funds we receive from your guests directly to you. Avoid the expensive handling and gift-wrapping fees charged by traditional wedding registries and enjoy the added convenience of an easily accessible and online registry. With our user friendly online gift registry, you can create a combination of any number of gifts, of any size, for any occasion, for all your guests to contribute towards. Sharing your registry with your guests is simple and easy. Rather than directly asking your guests to give money, let them contribute to a specific gift or experience they know you will cherish. Guests easily browse and purchase gifts. They choose which gifts and how much to contribute towards your online registry, and can leave a special message for you with their contribution. Create a bespoke registry with any gifts you desire. Personalize your registry with your own photos and a message making it truly unique to you and your event. Even choose a unique web address, making sharing your registry with guests easy and personal! The Hint Registry is perfect for every event, and any gift. From coffee makers, a honeymoon trip, or donations to your favourite charity. Be inspired by some of our featured online wedding registries. 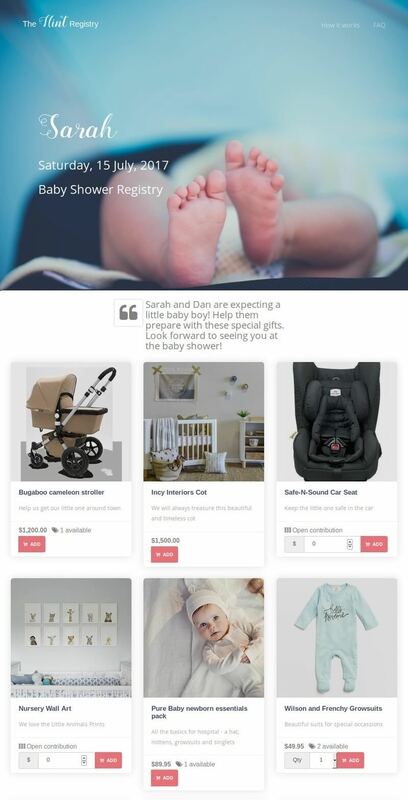 As well as our baby shower, and birthday gift registry examples. Once you’ve created your personalised online registry, you’ll be able choose a unique web address. Provide the link to your guests and they’ll be able to easily browse your selected gifts, and pay quickly and easily using either a credit card or bank transfer. 9 days after your event the money for your gifts will be deposited in your account, allowing you to purchase your gifts when it’s most convenient to you. Want to reduce the environmental footprint of your special day? You can greatly reduce the environmental footprint of your event through the use of our online services. Our online registry enables you to minimise paper and plastic waste, while still having a personalised and stylish digital gift registry. All this, just by using the Hint Registry. 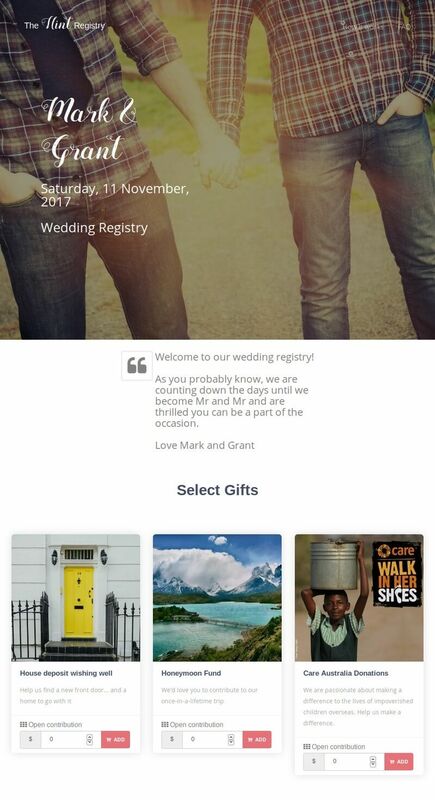 Consider using a digital inviation with a link to your customised wedding registry webpage. For those using printed invitations, adding your unique registry URL will allow people to easily access your online registry. The Hint Registry makes it easy to create an online registry for weddings, birthdays, anniversaries, or other special events and occasions.